It makes sense that Jon Clemens and Ron Musker directed Moana. The duo were essential in creating the so-called Disney animation renaissance of the late 80s and early 90s, having helmed two of the period's most beloved works, The Little Mermaid and Aladdin. Moana follows the same core premise that turned those films into family entertainment powerhouses: A plucky and adventurous teenager (Usually a "princess", in the unique Disney description of the word) wants to get away from their humdrum existence and live a life of adventure and excitement, only to get exactly what they wished through a series of mythical fantasy plot devices. It's The Hero's Journey 101, to be sure, but Disney successfully turned the simplicity of that proposal into its own unique brand by flourishing it with lively, colorful, and groundbreaking animation, catchy songs that fit a variety of tones during the story, wacky animal sidekicks, and various other tropes of the period that pretty much anyone who was born during the early 1980s can recite off the top of their heads. Moana follows that tried-and-true formula so closely, that it almost turns into yet another 90s nostalgia throwback that's so fashionable these days, even though the film's use of spectacular 3D computer animation and its narrative approach that affably mixes meta humor with straight old-fashioned mythology modernizes the project as much as possible. Clemens and Musker's embrace of contemporary blockbuster animation while confidently bringing their valuable previous experience to the table eventually creates an exhilarating new experience with the warmth of familiarity. 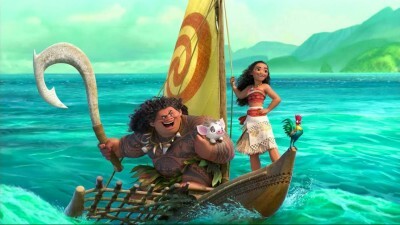 The plucky teenager striving to leave her humdrum life in search of adventure, complete with a passionate belting of the Disney trademarked "Get me the hell out of here" ballad, is the title character (Auli'i Cravalho), the heir of an ancient Polynesian village that's suffering from a shortage of fish, mainly thanks to a jokester demigod with equally inflated muscles and ego, named Maui (Hard to think of a more appropriate voice for this character other than Dwayne Johnson), stole the heart of goddess Te Fiti (Literally). Convinced that the goddess is punishing her people due to Maui's theft, and motivated by her desire to prove to her family that she's more than yet another benevolent but boring leader, Moana decides to set sail into uncharted waters to find Maui, get him to return the heart, and bring prosperity back to her village. However, once Moana finds Maui, she finds out that he might not be as cooperative as she hoped (At least she gets a Genie-style peppy self-boasting song out of him). Of course this premise is mainly used as an excuse to string together a series of action/adventure sequences that depict our protagonists coming across various conflict along the way. These sequences range from being delightfully trippy (A psychedelic battle with an exuberant giant crab voiced by, who else, Jemaine Clement), to shoehorned scenes crammed in for cynical reasons (You'd think a behemoth like Disney would have been above trying to get a piece of that sweet Minions money, but a bizarrely unnecessary sequence involving tiny, mumbling, sentient slapstick coconuts proves us wrong). What keeps Moana from turning into an episodic and predictable experience is the organically developed chemistry between Moana and Maui. Of course Johnson is effortlessly likable and charismatic in the role, but it's Cravalho's moving and touching delivery that keeps us continuously engaged. The songs, written by legendary Hamilton composer Lin-Manuel Miranda, finds a delicate balance between earworm ballads and toe-tapping fun. Unlike Frozen, the songs are not the stars of the film, and I think parents will be thankful that there isn't a single song that's nearly as annoying as "Let it Go". Moana comes to Blu-ray with a 1080p transfer with stunning beauty and clarity. The background elements in Moana are rendered with breathtaking realism, and this video presentation takes us to a virtual Polynesian past full of gorgeous beachside locations and the serenity of the vast nighttime ocean as an endless sea of stars lights it up. The lossless DTS-HD 7.1 comes to life during the film's many exciting action sequences, where every channel is used with power and clear panning to insert the audience into the experience. Yet it's during the musical segments when the sound truly shines and the lossless quality of the track is used to its fullest advantage. Inner Workings: A hilarious, inventive, and surprisingly introspective short. Gone Fishing: A 2-minute short that shows Maui futilely trying to catch a fish. It's so brief and cute, that it could have been used as a post-credits easter egg instead. Voice of the Islands: A touching 30-minute documentary that serves as a mini lesson on Polynesian history. The Elements: A quartet of short featurettes, each of them focusing on an important background element. The one about Maui's sentient tattoos is the most interesting, since it was hand-drawn. They Know The Way: Lin-Manuel Miranda and the rest of the music team candidly discuss how they created the songs in this 12-minute featurette. Deleted Song: Miranda introduces one of the songs that was cut out of the film. No big loss, in my humble opinion. Fishing for Easter Eggs: Auli'i Cravalho shows off some of the secret references to older Disney films in Moana. Deleted Scenes: A whopping 25 minutes of excised material. You can watch them with or without introductions from the directors. Music Video: Alessia Cara sings this Disney animation's version of the "I wanna get the hell out of here" ballad, called "How Far I'll Go". Around the World: A brief showcase of the same song being sung in different languages. Commentary by Jon Clemens and Ron Musker: The directors go through the details of the entire production in this informative commentary. Even though it falls slightly short of a bona fide Disney classic on par with the aforementioned renaissance period, Moana is a constantly charming and heartwarming experience for the whole family. The Blu-ray, with its stunning A/V presentation and bevy of extras, is a must for families and other fans.